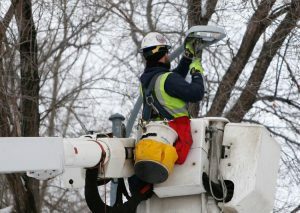 NorthWestern Energy will spend the next several months swapping out streetlight bulbs in neighborhoods across Billings. The utility company is replacing the old high-pressure sodium bulbs with LED lights in “several thousand” streetlights across the city in a move to make exterior urban illumination more energy and cost effective, said Jo Dee Black, public relations specialist for NorthWestern. The LED bulbs use roughly half the energy of the sodium bulbs and last two to three times longer. The price of LED bulbs has continually fallen during the past few years, making it a good time for NorthWestern to undertake the project, she said.